Happy 4th of July from Georgia Pass, CO!!! This image is in tribute to my first post on the 4th in 2006. No words to say, just beautiful! WoW!! Love your camera position and the strong colors. Very nice. 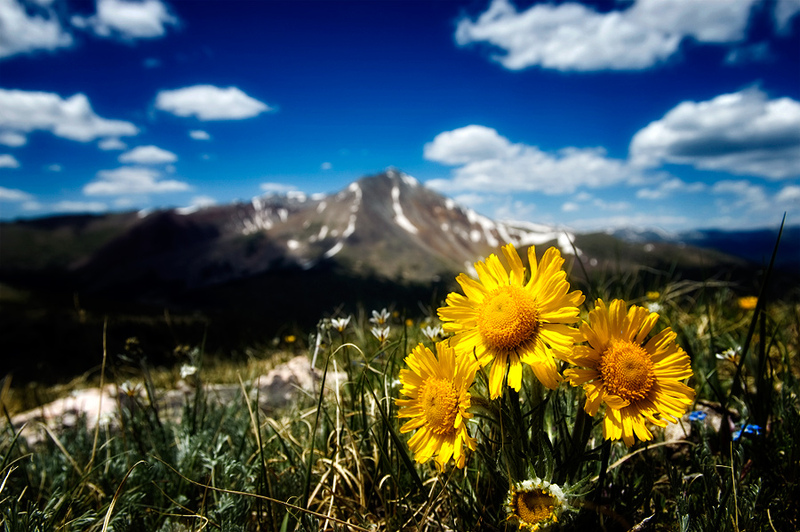 Very happy, colorful, gorgeous image…love the dof with the mountain in the background! Fantastic shot – it's very sharp and has some great colours! Absolutely fantastic. Love the colors, composition and details. Well captured and presented. Such gorgeous color!! Love the framing…especially how you captured the flowers in the foreground. 🙂 Great angle and colours! beautiful. love the colors. well done. great composition and colours – I like how you pushed the scenery to the background. Beautiful yellow combined with a bright blue sky is always a wonderful sight. i love the light on the sunflower here! Was looking through my RSS feed. Still love this image. Fantastic!! Love the angle and the intense colors. Excellent shot.